This gem of a gift basket offers ghostly goodies galore, in a gorgeous gift arrangement that they are sure to adore! 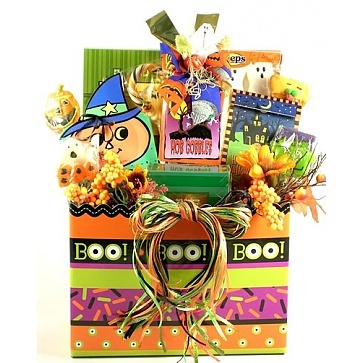 This gem of a gift basket offers ghostly goodies galore, in a gorgeous gift arrangement that they are sure to adore! This same cool box in a smaller size arrives filled with yummy Ghost Peeps, two festive Halloween Pops, Pumpkin Tote filled with Autumn Candy Mix, Apple Spice Cookies and Caramel Praline Cocoa!